Arteries bring oxygen-rich blood from your heart to the rest of your body and veins return oxygen-poor blood back to your heart. When your leg veins cannot pump enough blood back to your heart, you have chronic venous insufficiency (CVI). CVI is also sometimes called chronic venous disease, or CVD. Call 305-854-1555 or click here to book a consultation at the Miami Vein Center. Deep veins lead to the vena cava, your body’s largest vein, which runs directly to your heart. CVI can also cause problems with leg swelling because of the pressure of the blood pooling in the veins. Your lymphatic system may also produce fluid, called lymph, to compensate for CVI. Your leg tissues may then absorb some of this fluid, which can increase the tendency for your legs to swell. In severe cases, CVI and the leg swelling can cause ulcers to form on the lower parts of the leg. DVT occurs when a blood clot (properly called a thrombus) blocks blood from flowing toward the heart, out of a deep or perforating vein. The blood trying to pass through the blocked veins can increase the blood pressure in the vein, which, in turn, overloads your valves. Vein valves that do not work properly are called incompetent because they stretch and no longer work efficiently, and incompetent valves contribute to CVI. 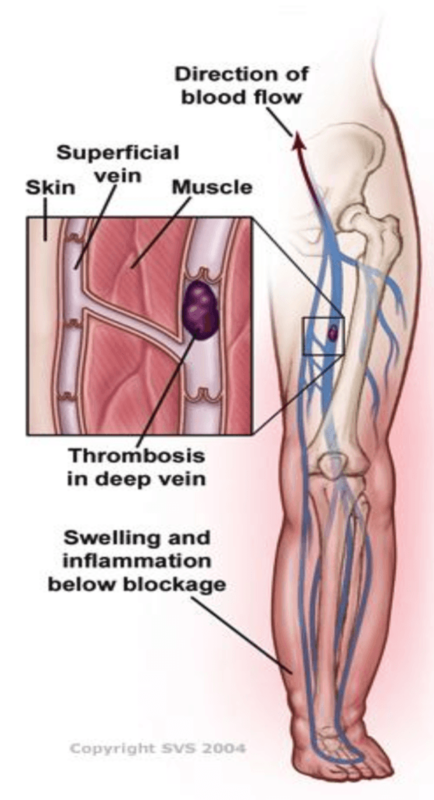 DVT is a potentially serious condition that causes leg swelling and requires immediate medical attention because sometimes the blood clots in the veins can break off and travel to the lungs. This condition is called a pulmonary embolus. First your physician conducts a physical exam. Your physician will measure the blood pressure in your legs and will examine the varicose veins. To confirm a diagnosis of CVI, the physician may order a duplex ultrasound test or sometimes another test called a venogram. Duplex ultrasound allows your physician to measure the speed of blood flow and to see the structure of your leg veins. A venogram is an x-ray that also allows your physician to see the anatomy of your veins. More serious cases of CVI may be treated with injections, called sclerotherapy, or with surgical procedures. Fewer than 10 percent of people with CVI require surgery to correct the problem. Surgical treatments include ablation, vein stripping, and angioplasty or stenting of a vein. In more severe cases of CVI, your surgeon may recommend angioplasty or stenting. An angioplasty is the use of a balloon to push open a narrowed or blocked portion of the vein. A stent is a metal-scaffold tube that helps to keep the narrowed areas open. In some instances, depending on where the vein blockage is, this may be used to open up the blockage. The procedure is performed through small needle punctures in the veins, either behind the knee or in the groin. To learn more about Chronic Venous Insufficiency, please contact the Miami Vein Center by calling 305-854-1555 or click here to book a consultation with board certified vascular surgeon, Dr. Jose Almeida.